Approximately 700,000 tons of garbage is generated daily by Americans. To break that down, it means that the average American produces 4.4 pounds of trash every single day. By comparison, the global average is 2.6 pounds. In order to reduce the amount of waste we produce here in the states, many offices have gone green. Over time, offices can quell the amount of paper, cardboard, and plastic waste that they produce by following these simple, but effective, recycling tips. People are creatures of habit; office workers perhaps even more so. By establishing a central recycling area, you can get employees in the habit of recycling their materials throughout the day. To effectively create recycling areas, you should communicate the changes to staff ahead of time and place the recycling bins in locations that are frequently visited (such as the breakroom). Having separate waste bins for each recycling option is key. 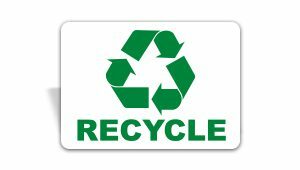 Offices should provide bins for paper, aluminum, plastic, and glass materials in the designated recycling areas. Use color coded bins or Recycle Signs to make waste segregation easier for personnel to recycle the right type of materials. Most office waste consists of printer paper. By selectively printing your documents or setting up your printers to print double-sided, you reduce paper consumption. Just think about it, setting your printer to duplex printing can theoretically reduce paper waste by fifty percent. Once you establish a recycling system at your facility, it might be a good idea to remove as many general waste cans as possible (such as personal trash cans found under desks). The key to keeping a green office is having a small number of centrally located general waste bins while promoting a much higher ratio of recycling bins around the facility. While all of the recycling we’ve discussed thus far has been related to personal use, electronic waste shouldn’t be forgotten. Collect e-waste, such as old wires, batteries, gadgets, etc., and safely recycle them by taking them to one of many nonprofit organizations near your office. Some municipalities also offer you a place to drop of electronic materials. Making your office green may take some initial effort to get going, but it’s not too difficult to reduce waste. Break wasteful habits now to promote more mindful ones tomorrow.